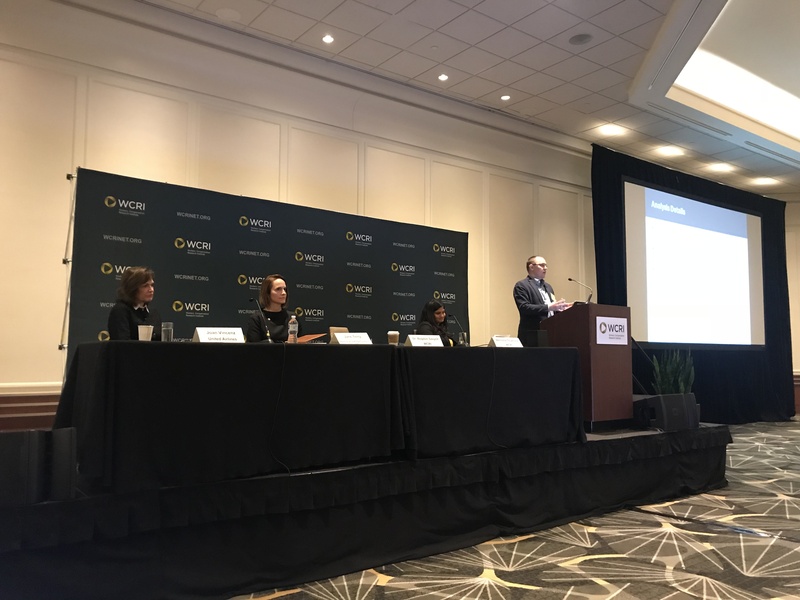 On a panel discussing opioids, Dr Bogdan Savych of WCRI opened with a review of WCRI’s latest research looking at the link between opioid prescribing and the duration of disability. It is great to see WCRI spend a big chunk of time and research dollars on this – which I believe is the biggest problem in workers’ comp today – and will get worse long before it gets any better. One of 10 workers who get opioids are still taking them after 90 days. Dr Savych’s study looked at low back pain cases, noting that most guidelines do NOT recommend opioids for low back pain – and certainly not for long term treatment. Workers with longer-term opioid scripts had more than triple the duration of disability of those who did not use opioids over the long term. Takeaway – Do everything you can to prevent workers from taking opioids over the longer term. I tell them the truth. They cause opiate induced hyperalgesia, death and are causing the pain in chronic pain cases. The CDC guidelines are shown: 3 to 7 days unless you have cancer or are dying. Even if your doctor is giving them, they are still not safe or needed after the aforementioned time frame. Absolutely false and what you said will kill millions. Fred – Adam is correct. Do not attack other commenters. Further, cite sources for your statements. Last sentence should read “prevent everyone” from taking opioids over the longer term. Great writing today! All so true. Joe – You said it … Employers need to do everything they can to prevent workers from taking opioids..including good old time tested ‘Early Intervention’!! MagnaCare is launching a program here in NY that collaborates with the employer, PBM, and docs and we are looking forward to measuring our results both financially (decreasing some of the costs you mention above) and improving quality of life for workers. And when it’s too late for prevention, we support workers through addiction treatment. Employers need to understand that it may increase up front cost but save money in the long run. This is a huge issue for employers – I am looking forward to the WCRI research – they always do a great job. I spoke with an injured worker this week- she is all but 5 years post surgery, she is wearing the highest possible opiate pain patches. I asked her what she is doing to reduce the amount of medication she is on, her response was that her treating medical provider isn’t concerned. As with far too many injured workers this injured worker has an addiction to opiates. Chronic Pain lasting six moths or longer and is severe needs not only opiates but also physio and any other treatment available. A person cannot function either mentally or physically when in pain. The opiates reduce the pain enough so a person can function. All people regardless of pain or whatever will become addicted to painkillers as they are addictive. Yet those in pain rarely continue taking them once their pain causes are identified and fixed. Denying long term pain medications for those suffering severe chronic pain will kill them. Chronic pain causes high blood pressure, sleep deprivation, and depression, all leading to the suicide of the or even heart attacks and strokes. This is the real reason for cutting back on opiates. It is a genocide of the disabled based on false science and corrupted science. All for the insurance companies and corporations that are just trying to wiggle their way out of their responsibilities.i. You are wrong in almost all of your statements. There is no evidence opioids work to improve functionality and ample evidence they have the opposite effect. There is little evidence they work for chronic pain; almost all research indicates they have the opposite effect, exacerbating pain. If you have credible sources to support your assertions let’s see them. As far as your inflammatory statement about genocide, that’s deeply offensive. The reality is the opioid industry and its apologists are the one guilty of mass murder.